Get ready for some serious high-capacity screen lifting. With the newly updated Humanscale M8.1 Monitor Arm, you can pose your monitor at your ideal heights in no time, organizing your cables and cords concurrently. The arm is ready to lift monitors 6 - 28 pounds for secure ergonomics you can count on, every time. The Humanscale M8.1 also features a modular design with interchangeable links, so switching up parts is easy when your workstation evolves in the future. Height adjustment range Up to 12"
The Humanscale M8.1 Monitor Arm is designed to mount to a multitude of surfaces. Clamp, bolt-through, slatwall, direct wall mount, Frame One mount, and c:scape mount are available. A combination clamp and bolt-through mount is also available. 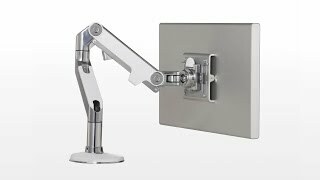 You can also upgrade to the M/Connect dual-video docking station mount to simplify and streamline your workspace. This mount clamps to the desk and consists of an above-desk USB hub and a docking station with more ports that is located beneath the desk for a cleaner look. The M/Connect will come in colors to match the color scheme chosen for your monitor arm: Polished aluminum with white trim and cables, silver with gray trim and cables, or black with black trim and cables. The Humanscale M8.1 Monitor Arm is available in your choice of three finishes: polished aluminum with white trim, silver with gray trim, or black with black trim. The Humanscale M8.1 Monitor Arm is customizable with a wide variety of arm styles. You may choose a single link or create a more flexible arm with any of the two link options. The different link components are outlined below. The Humanscale M8.1 Monitor Arm comes with a standard ball joint only. Your monitor will attach directly to the Humanscale M8.1 Monitor Arm with a VESA plate adapter. Most monitors come with a standard 100 mm x 100 mm VESA adapter, but larger or older monitors may have different sizes. Please check with your monitor's manufacturer if you are unsure what size plate your display requires. I have just one word to describe the M8.1 monitor arm: amazing! I've never thought that a single piece of equipment could change so much the long hours spend at my desk. The freedom of movement added to the monitor makes all the difference and the smoothness is top notch compare to other monitor arm I've tested before purchasing the Humanscale. It's also very easy to set up. Very high recommended! Got this to replace Knoll mount that had my monitor annoying taking a slant forward with increasing frequence. This was easy to assemble and seems like high quality as it should be for the price! I had assembled with monitor on in less than 10 min, even with several interruptions while I was working. Only complaint is that it shakes a bit more than the previous if I type too hard. Some adjustments for mounting spot on desk and arm may help -- it does seem to be getting better with time. Slanting issue is fixed so far with tensioning the ball joint. FYI -- if looking at the help pages for descriptions of the links/arms, pictures do not match description. From what I can tell 'fixed angle' is what is shown on home page for the product. Pics on help pages show the straight link. Mounted this bolt-on to a standard leather top desk. The desk is thinner than the supplied kit can accommodate resulting in the mounting bolt bottoming out into the arm mechanism. Resolved this by using some washers (4 of them). The major issue I have with this monitor arm is the sloppy play between the monitor quick release mechanism and the monitor arm attachment. There is so much movement it is difficult to get the monitor level. I may try to shim it but it is not what I expect from a $400 monitor arm. I would rather have a stable hard connection than a sloppy quick connection. Other than that it is a good arm. So far so good. Solid, sturdy construction, easy to use - and great to have my monitor instantly at different heights. I work from home and am in front of my computer almost all day. Getting a good chair helps prevent back issues, but it's not very useful if the monitor is so far away that you need to hunch forward to read the screen. This is where a monitor arm comes in. An added perk is that you can push the monitor out of the way if you need to use some desk real estate since it is mounted to the back edge of the desk. Routing the cables is very easy and it is easy to remove or add cables after the fact without any tools. It takes about 10-20 seconds to add a new cable. The clamp mount is very solid and is very sturdy attached to my 0.8" thick Ikea Galant particleboard desk, which is a fairly thin desk. I use monitor arms for a 24" and 20" monitor and haven't had any reservations about the stability of the system. I'll be using a 27" Apple Cinema display on it shortly, which would stress it a bit more but should be well within the weight requirements of the arm. I'll update this review with that in the future. Turning the monitor side to side is extremely easy and takes no effort at all. Raising and lowering the monitor also works very well, requiring only a tiny bit of effort if properly calibrated. Adjusting the spring is as easy as turning a screw with the allenwrench provided (which you can conveniently store on the mounting bracket behind the monitor!). Why did I take off a star? Repositioning the monitor in other ways is not as easy as it should be. The most common use of a monitor arm is pushing the monitor further away or pulling it closer to you. In theory, I should be able to move it in a straight line so that it stays directly infront of me. In practice, the monitor moves in an arc. As a result, pushing it away from me also moves it to the left (or right depending on how the arm is positioned). Conversely, pulling the arm towards me moves it to the right. The reason is because while there are two pivot points on the arm, the pivot closest to the base doesn't readily turn, probably due to friction from the amount of torque on it from the weight of the monitor. Instead of being able to adjust the monitor by just pushing/pulling the monitor, I have to awkwardly push and pull the base of the monitor arm if I want to keep the monitor directly in front of me. I found it's too much of a hassle to do that and resigned to turning my head to follow the monitor when I push it further away. I found that the Steelcase FYI Monitor Arm works better in this respect, but sadly it is not an arm well suited to heavier monitors. Similarly, tilting the monitor up and down can be finicky. Luckily, this is not something I do day to day. Just set it up once and forget about it. Nonetheless, it takes quite a bit of force to change the angle. The amount of torque of the ball bearing can be adjusted with an allenwrench (also provided), but I found that too loose and the monitor will flop down. Consequently, the torque has to be quite high and so trying to tilt my monitor takes a good amount of force -enough to hear the plastic of the monitor frame flexing. Overall, for heavier monitors (24", 27", Apple iMacs, etc.) I believe the Humanscale M8 Monitor Arm is the best solution out there. It is sleek, almost dummy proof to setup, and works well. The difficulty of pivoting the base of the arm is the only flaw (although a fairly major one) of an otherwise perfect arm. Plus, Humanscale's 10 year warranty is really quite unbeatable. $459.00 List Price: $504.00* The list price is the same as the MSRP (Manufacturer's Suggested Retail Price). It may not necessarily be the price at which the product is sold.